Both customer experience (CX) and user experience (UX) professionals should require the use of user or customer journey mapping in determining the ideal customer and user experience, says Forrester Analyst Leah Buley in this EffectiveUI blog post. The rising importance of CX and UX has inspired us to share our collection of the most comprehensive instructions from our corporate Miro library, which we hope will be helpful in your customer journey mapping too. Look through this brief presentation about customer journey mapping or read the full article below. Provide a list of related templates that could positively affect your customer journey mapping and a list of useful links. Why did we collect this information? Because current trends prove that ideal customer experience is going to be a cornerstone of a company’s success soon. According to Econsultancy Digital Trends 2015 report, which was based on a global survey, customer experience is considered to be the main opportunity in 2015-2020 to differentiate from competitors, beating out current markers of success (like product quality and competitive pricing). Read our recent post on the four remote collaboration trends that drive the adoption of virtual whiteboards for customer journey mapping. It means that customer experience soon will be, if it is not already, the key factor determining referral, retention, revenue and overall growth in the majority of businesses. Another study conducted by Esteban Kolsky (a customer strategist, researcher, and consultant) shows, among other things, that customers are looking for a guaranteed quality experience. Kolsky’s results show that only 1 out of 26 unhappy customers regularly complains and that the rest simply churn; he also finds that 67% of consumers cite bad experiences as the reason for churn. Ultimately, at least 91% of unhappy customers will simply leave without a complaint. Currently, most companies are struggling to get customers’ attention and acquire new-comers, but this is not a financially sound strategy: “it is 6-7X more expensive to attract new customers than to keep existing customers,” according to the research. That means that the real competition starts in the middle of the marketing funnel and that the focus really needs to be on improving the experience for existing customers. The question then becomes: How best to implement strategies that will be successful in this area? 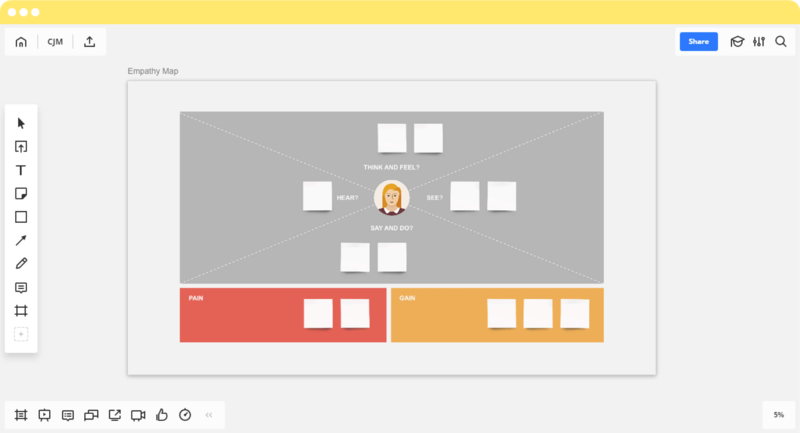 Design Thinking 101: Customer Journey Mapping from Peer Insight on Vimeo. The customer journey map (CJM) is one of the main tools that allows us to understand and improve customer experience. This video from Peer Insight shows a sample Customer Journey Map in action; but in essence, it is a graph which illustrates the steps customers go through: from initial contact, through the process of engagement, and hopefully into long-term loyalty. It may focus on a particular part of the story or give an overview of the entire customer experience as they interact with a company — whether it is a product, a website, a retail store, a service, or any combination of these. It usually treats individuals as real or potential customers, so it shows a path how people either become customers or leave. The more interaction steps are described, the more complicated — but also the more informative and useful — such a map becomes. 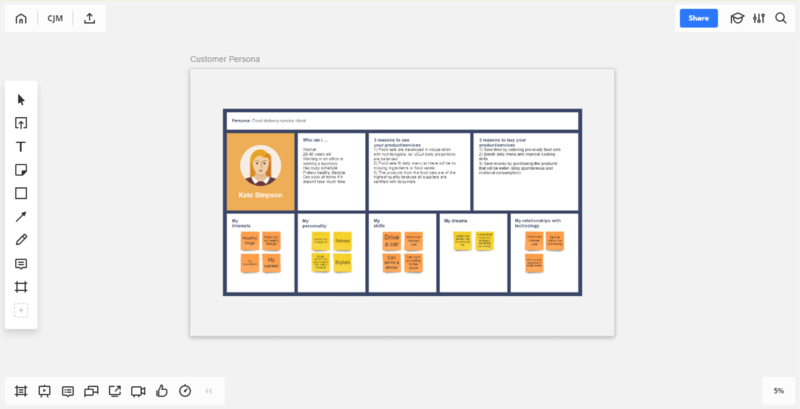 There is an endless number of customer journey map templates, but a basic template includes a specific persona, the steps beginning-to-end of the customer experience (including touchpoints), and the potential emotional highs and lows. Other parts of the journey are optional and depend on your objective. User Experience Designers identify points in the customer experience that are disjointed or painful. However, the finished map could be simplified and expanded to the entire company under the condition of non-disclosure. The process of customer journey mapping varies from one company to another. Usually, it depends on the resources you have (people, time, equipment, etc. ), the template, and the facilitator’s experience. 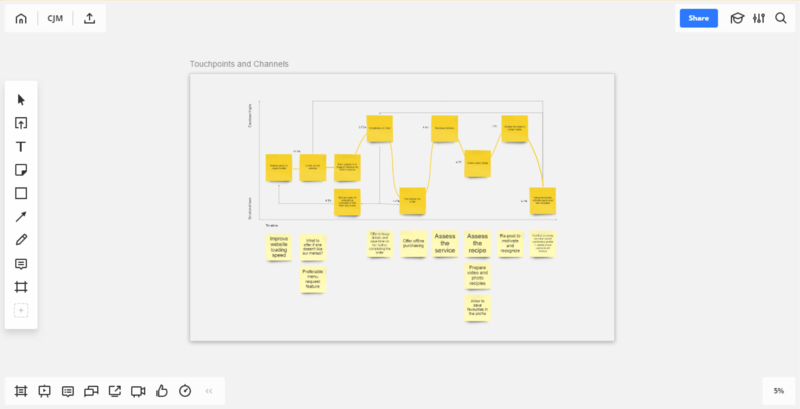 Below you can find one of thousands of possible scenarios for customer journey mapping. During this phase, you have to define a customer persona that is relevant to your goal and the scope of activities you would like to assess, and then gather the maximum data about this persona. How does one gather this data? You will want both quantitative and qualitative information to gain the deepest insight into your customer.The more data you can get — the more chance you have to understand customer values and experience correctly. The more data you can get — the more chance you have to understand customer values and experience correctly. Quantitative customer research like surveys, testing, and web analytics will show you conversion rate and customers’ pain points. While this is important, it is almost useless without qualitative research that complements your data and gives deep understanding of customers’ emotions, goals, attitudes or motivations. 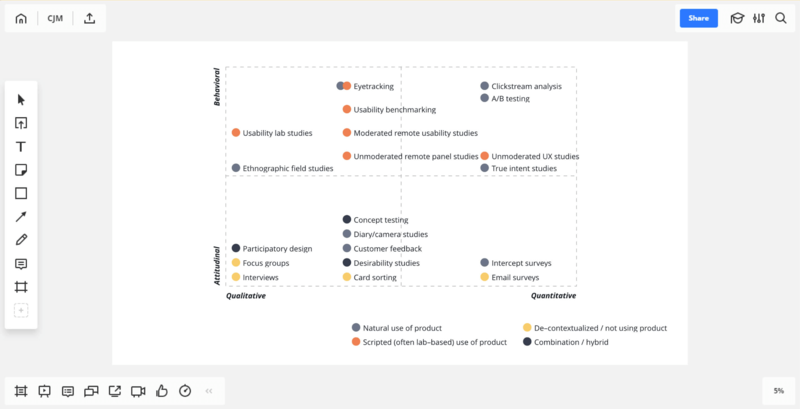 Qualitative research includes interviews, focus groups, and field studies. Kerry Bodine, customer experience consultant and the co-author of Outside In: The Power of Putting Customers at the Center of Your Business, even suggests inviting customers to a journey mapping workshop where you can ask them directly about their thoughts and feelings at each step of the journey. To kick things off, start with an introduction phase to ensure that everyone is on the same page before you begin. Set up a date for the workshop, create a shared space, and get together a cross-functional team that represents different departments and seniority levels. Once everyone has gathered, explain the stakes and the goal of the workshop and agree upon the schedule. Since customer journey mapping is a kind of brainstorming activity, consider additional exercises that will help you to warm up the participants or refresh them if they reach a deadlock. Plan for the lion’s share of the time to be the brainstorming activity. Select a brainstorming technique that you feel will best help your cross-functional team generate new ideas for future customer experience. The discussion will start with a briefing about the customer persona and then an analysis of the research. Then, the team should generate as many touchpoints as possible and consider relevant channels between them. A touchpoint is a point of contact between the customer and your product. Each touchpoint is an opportunity to strengthen the relationships with the customer and move towards the greatest customer experience. Usually, they are mapped either as a timeline, a tree, a spider or a wheel. It is important to let your team “tell the story.” Do not interpret user feedback; rather, let your team see the whole picture by first capturing the stories via whatever creatively makes the most sense: stickers, mapping using flowcharts, writing stories with text, illustrating with pictures, acting if necessary — whatever works! 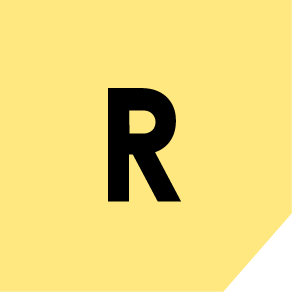 “Use arrows to illustrate connection type between touchpoints”. One task leads on to the next. One task leads to the next, but user can go back. User moves between different variables in a controlled environment. User moves between different variables, related or not. Facilitate the process so that maximum attention can be devoted to gathering touchpoints because they determine CX and what customers think of your service. Touchpoints and the path between them are vital because they are the exact places where we see users leaving. While brainstorming, try to map as many existing and potential touchpoints as possible and encourage your team to put themselves in the shoes of the persona when analyzing. Key Performance Indicators (KPIs) showing the quality of the service provided in each touchpoint. Make sure that even if you used a physical whiteboard for the customer journey mapping, someone is responsible for digitizing the final layout, because it should be an editable and shareable piece of work. While digitizing your customer journey map, you are free to invent your template or use one of the thousands from the web. We use Miro template, which allows us to collaborate in real-time from any place and share the results with the entire company, including remote employees. After the map is ready, analyse whether each touchpoint is convenient and gives value to the customer. The gaps between the desired customer experience and the one actually received should be your action plan. An effective action plan should cover deadlines, responsibilities, budget, KPIs and success criteria. 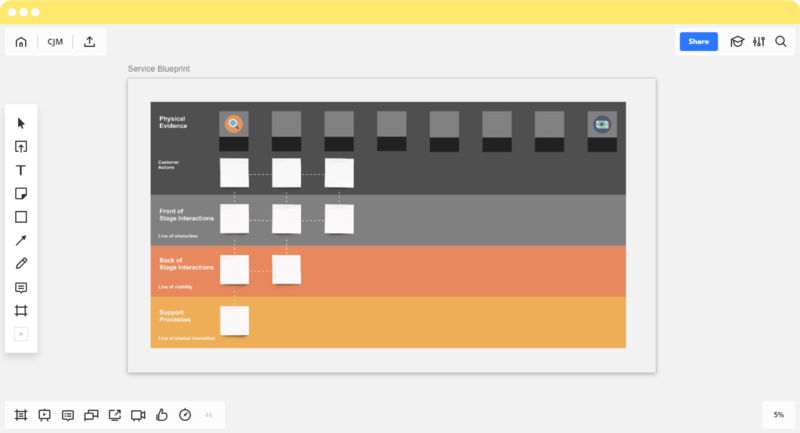 In Miro brainstorm touchpoints and barriers using Sticker tool, because it is easy to copy them and transfer to sticky notes backlog, prioritize using tags or Emojis, discuss and track progress via mentions in comments. New popular tools, behavioral patterns and communication channels arise almost every month, and the customer journey map needs to be adapted accordingly. Consider establishing a standard schedule for revising your customer journey map. For example, it may be once per quarter. During the revision process, point out what may have changed and what KPIs have been achieved. If there are gaps or red KPIs, another brainstorming session starts. Online tools like Miro (from $10 per month), Touchpoint Dashboard (from $65 monthly) and UX360 (from $500 monthly) will save you time on the illustration phase if you plan to repeatedly revise your CJM. Now that you have an idea of what CJM is, and how to go about creating one, it is important to understand why implementing this process is so necessary for a company that wants to become or remain competitive in today’s changing market. CJM shows who, where, when and how the customer interacts with the product or service, making the experience as transparent as possible. CJM highlights the customer and what the customer values because it focuses on their feelings and needs at every stage of interaction. CJM helps you design the most economical system for lasting value. CJM leads not only to improvements in current features but also showcases opportunities for innovation, allowing for “a-ha!” moments. CJM allow the team to optimize costs because it highlights priorities and areas not valued by the customers so that you can relocate resources to the most critical gaps or to the touchpoints most likely to “convert” a customer. CJM examines the brand promise that you sell to customers through many channels (for example, a complicated sign up form doesn’t correlate with an “effortless” characteristic). CJM shows opportunities for improvement because the map reveals barriers. It examines whether the customer life cycle is in a logical order, or if there are gaps between the desired customer experience and the one that is actually received. CJM helps to develop cross business alignment across the organization and improve external communication. 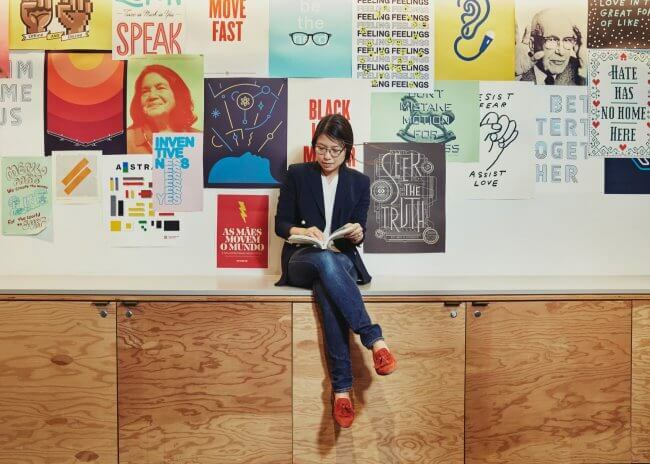 CJM, shared with the entire company, makes people who communicate with customers in the touchpoints feel more responsible for the experience they make. CJM helps you to find ways to differentiate from your competitors. We can endlessly create the labels, and they are all correct. An example inspired by the presentation of Chris Risdon from Adaptive Path. It should now be clear that having some kind of tool for your company to track customer interaction and visualize feedback is vitally important. However, you may be wondering why a customer journey map should be used. Why not a different kind of map, instead? While the boundaries between the tools are becoming blurred because they all cover related topics, it is not the terminology that should be discussed, but the purposes and goals of each so that you can benefit from the tools to the fullest. On the other hand, the perfect customer journey or user experience map is a part of an Outside-in world, where we describe “how the service is experienced” or “what happens to the individual” so it helps to adapt the product to the audience behavior. 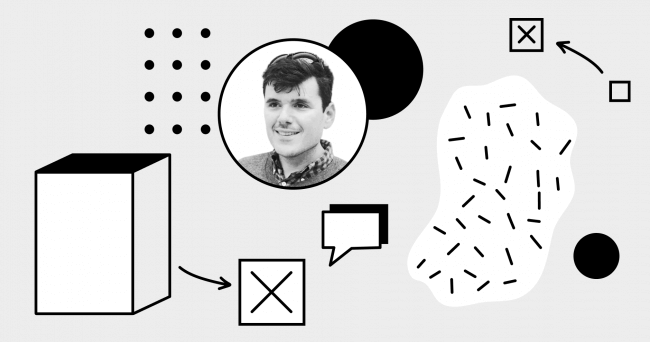 However, there are no rules prohibiting you from merging parts from those Inside-out and Outside-in worlds, and it positively influences UX and CX when they are used in conjunction, so it could be even more useful to look at the intersection of all diagrams. To understand how best to use each one, let’s briefly scan the tools in more detail. The user experience on a website, specific domain or any other free service. The map shows how the experience fits into a person’s life. 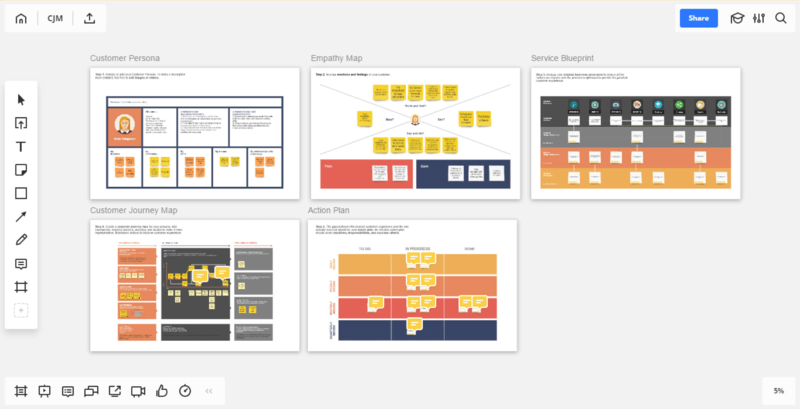 If a service is being considered, the UX journey map examines user engagement to improve the service and make the user’s life simpler and easier. Both a UX journey map and a customer journey map look quite similar because they cover the same ideas. However, according to Adam Ramshaw, Australian expert in customer experience management and customer loyalty management, they are different and treating them as if they are the same is confusing for all concerned. The difference is that the experience map looks at individuals in the context of human behavior, while the customer journey map considers individuals specifically as current or potential customers. Also according to Adam Ramshaw, the UX journey map doesn’t necessarily describe the interaction stage (like subscribing, purchasing or getting in contact), while the customer journey map covers the whole user path starting from awareness, going through sales and finishing with continuous service usage. This means that while both styles of map perform essentially the same function, a customer journey map is more specifically tailored to the needs of a company looking to improve customer experience and especially how to improve or increase touchpoints. The goals of the user differ from the goals of the customer. 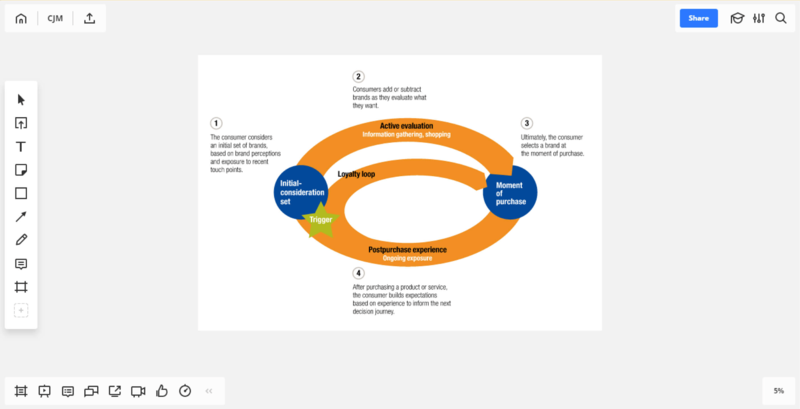 A sales automation journey map helps the marketing team increase sales by mapping the user’s path to becoming a paying customer through the use of triggers, or messages that reach a customer at the right time in order to increase brand awareness and hopefully create a loyalty loop that brings the customer back time and again, as seen in the diagram below. A sales automation journey map can often become quite complicated because it is not linear, and it needs to predict the path for many different personas to move from consideration to paying customer. Fortunately, the steps are easily tracked and measured, which is why a sales journey map can help to customize marketing and sales strategy. It can be used to determine which scenario converts customers more frequently and which drives the biggest income from a single customer. 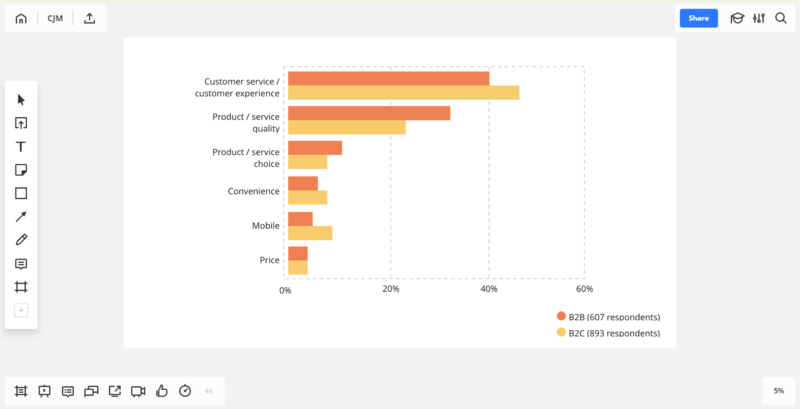 The biggest difference from the customer journey map is that the sales journey map does not consider the product at all, merely the marketing needed to connect with the customer. A service blueprint is a visual tool designed to establish effective business processes. Just like product companies use blueprints to help them construct products and buildings, service businesses use blueprints to ensure all the factors are in place and the processes optimized to provide great customer experience. 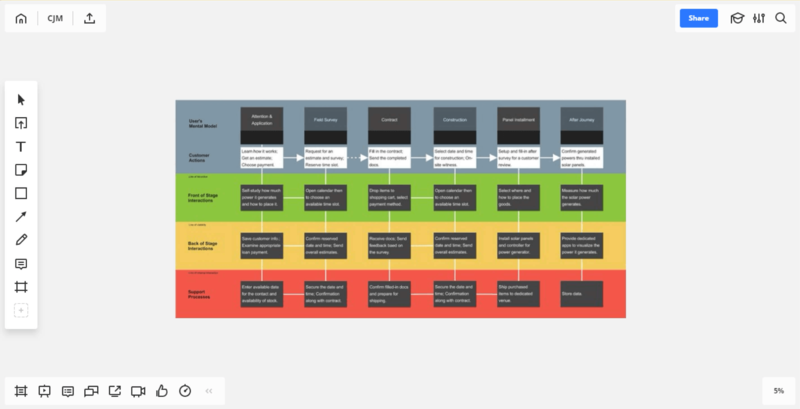 The service blueprint provides a visual for the person providing a service to see the steps in the process that they need to accomplish behind the scenes. 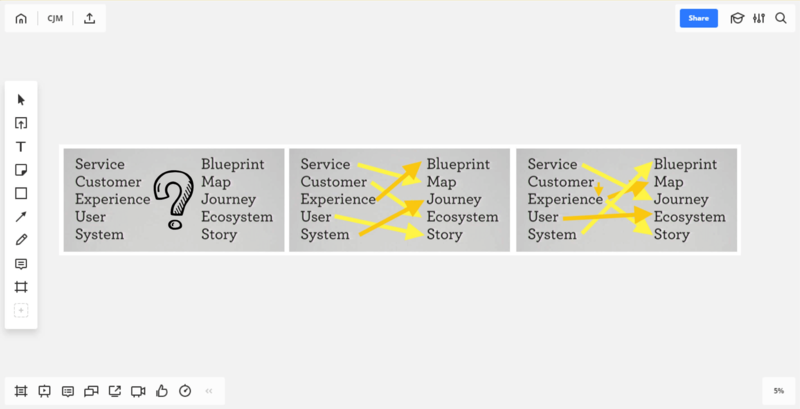 Service Blueprint by Mario K. SAKATA, UX Architect & Product Manager, Founder of UXTokyo and LeanUXCircle. Local Ambassador at Medium Japan. 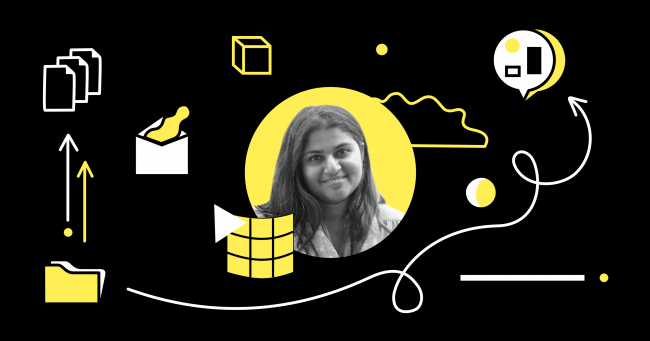 Since it focuses on the process as opposed to the experience, a service blueprint shows the backstage of the Inside-out world, but will have a lack of information on user experience. Fortunately, a customer journey map covers this problem (mapping the user experience), and these two diagrams are often aligned. 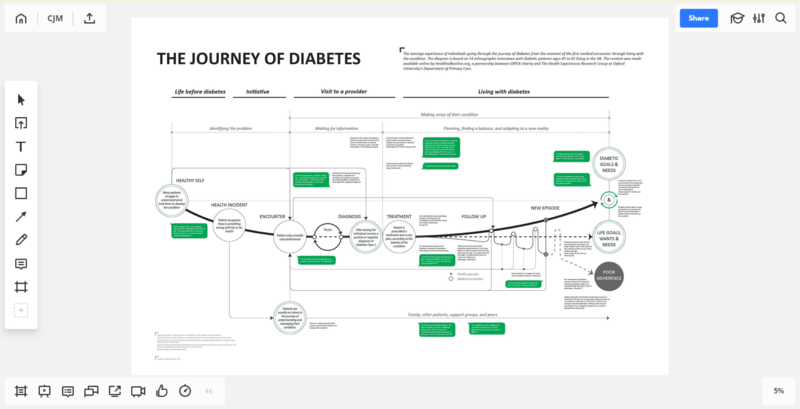 In this case, the customer journey map describes a user and acts as a step in the decision cycle, while a service blueprint captures the flow of all business processes impacted by the journey. 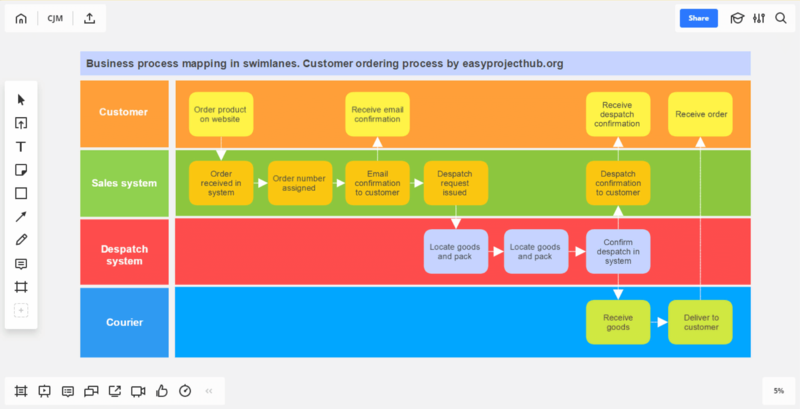 The process map is very similar to the service blueprint — it maps the process activities flow, plotting out responsibilities, business standards, and KPIs or success indicators. It’s necessary to map processes if you want to train the staff to a single standard, identify opportunities for improvements or assess the influence of any upcoming changes. A process map is often developed by specialists or by specific departments because it is important to have expertise in the internal process. 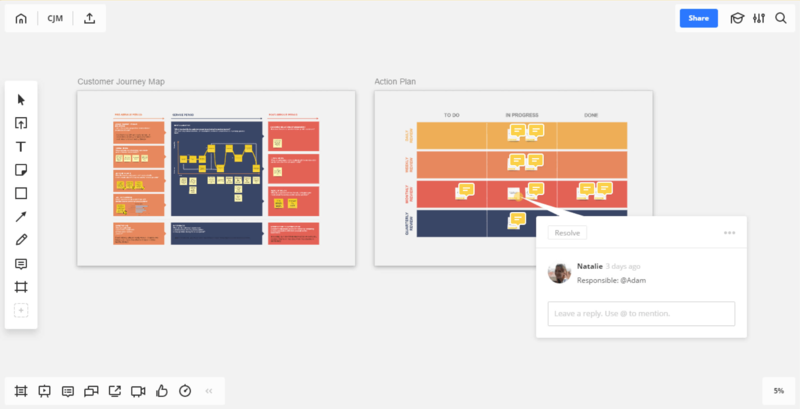 This is different from how a CJM should be developed; since a customer journey map is not focused on the internal world, the team can (and should!) be cross-functional, representing all departments involved in the customer experience. 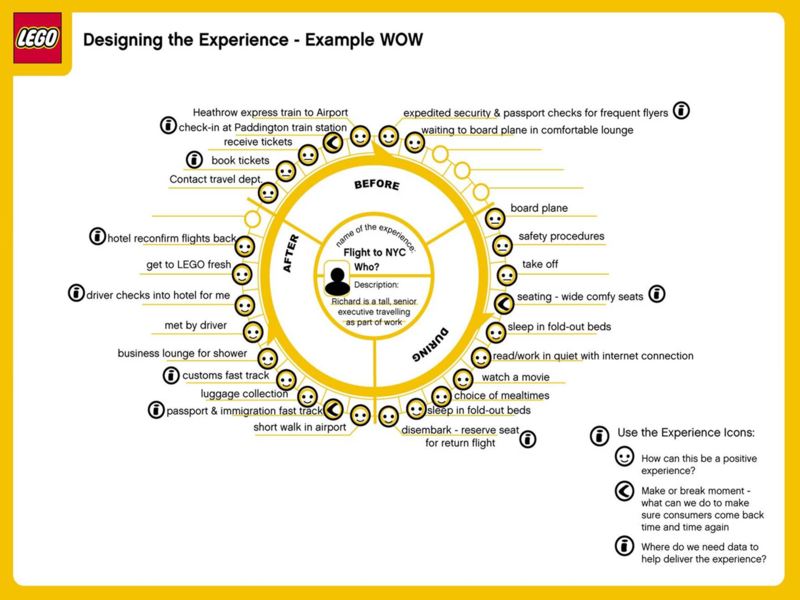 As you can see, any of the diagrams mentioned above could positively influence UX and CX, and the most powerful journey map combines all of these types of maps so that the internal perspective will be developed in conjunction with an understanding of the customer journey. 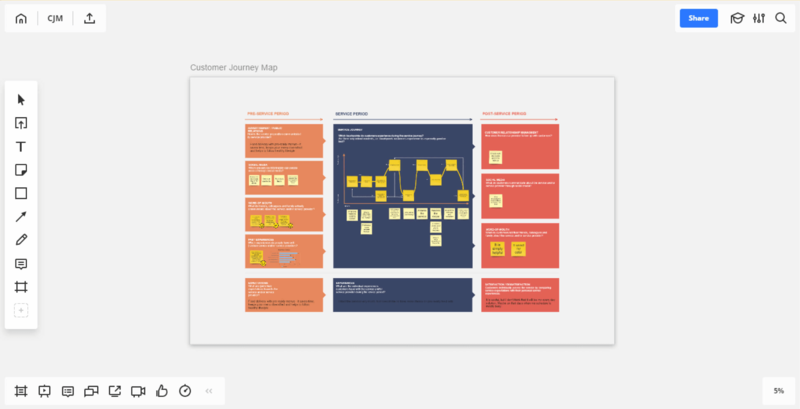 The most powerful journey map combines all of Inside-Out and Outside-In maps so that the internal perspective will be developed in conjunction with an understanding of the customer journey. Customer journey map is a single linear path. Flexibility is the key to great customer experience. Recreating a linear path of the customer experience is a waste of time because customers take many routes to complete a sale. considering them as occasional or unimportant. To make your map as useful as possible, you need to include every point where your customer comes into contact with your business. According to research from McKinsey & Company, the number of touchpoints is increasing in number by around 20% a year. Do not forget about social media channels, collision touchpoints, and the post-purchasing period! If you interpret your customer’s experience, you will wind up in a situation where you shoot in the dark because the chances that you guessed right are next to zero. Let the information speak for itself. Each customer persona is unique. You may wish to group them according to research results, but each group requires a dedicated customer journey map. It’s true that pain points are vital opportunities to dramatically increase customer satisfaction, but don’t forget to figure out your success points. These play an important role in emotional decision making, and extending the positive experience is an opportunity, too. Customer journey map doesn’t include an action plan. The gaps between the desired customer experience and the one actually received should be your action plan. Set it as a clear expectation of the result — each participant of the workshop should understand it. Then, carry the vision through planning and execution. Don’t neglect this! There are two ways to work with the gaps and barriers: improve the touchpoint or remove it from the process. If you let the situation flow as it is, it will turn out in the frozen or decreasing AARRR metrics because many disappointed users will continue silently leaving. And don’t forget that any successful changes conсern three angles of the process (not one) — customers, business processes, and corporate culture/structure. A customer journey map is a powerful tool which, if used properly, positively influences customer experience, which in return improves retention and revenue metrics. Although it is not a magic bullet that can solve all your experience problems at once, it helps to add value for your customers. The tool itself is rather complicated because it deals with behavioral patterns of different audiences and requires discipline. Trying to make the path simpler is tricky because it usually leads to the above-mentioned set of most common mistakes, like creating a CJM from the company perspective. The ability to edit the document or share it with the departments who work with product and Customer Service is absolutely vital. Feel free to customize the process of the customer journey mapping and improve it from one revision to another. Since this article is a collection of best practices across the web and Miro experience, we welcome you to share your thoughts, cases, and references in the comments below! Or check out the links to related templates (like Persona) and other useful links below. While creating the customer journey map, the following templates can help you make the process smoother. Use all of the templates together with the customer journey map on one endless online board to get a helicopter view of the problem. 3. Practical Service Blueprinting Guide. 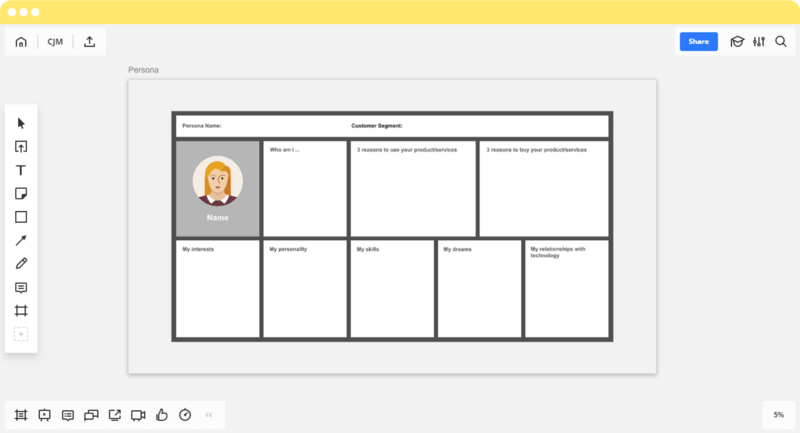 Persona template provides a basis that keeps your customer journey mapping attempts focused. Empathy map is a tool to articulate what you know about a particular type of user— their needs, goals, expectations, behaviours, pain points, and so on. Service blueprint is related to the internal corporate processes that determine the customer journey.